It's been a while since Sir Paul McCartney was mobbed on stage. He seemed to enjoy it at a recent gig in Brazil, even though the stage invaders were a swarm of large green grasshoppers who seemed to have an unaccountable love of the mawkish ballad 'Hey Jude'. 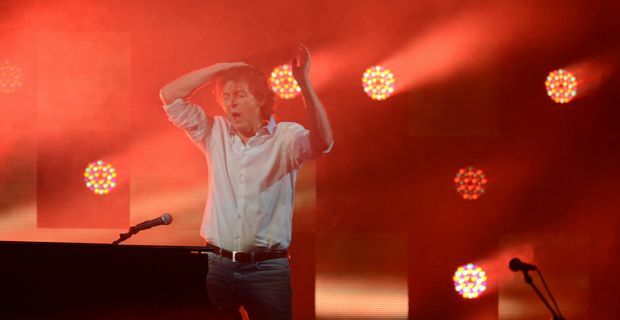 McCartney was playing to 47,000 fans in Goiania when the gatecrashers got past security and settled on the 70 year-old for the duration of the song. When he sang the words "the movement you need is on your shoulder", he added, "it certainly is now". That was the legendary Scouse wit for which the Beatles were famed back in the less picky 60s. Well, guess you had to be there. Experts were unable to say whether the insects were attracted by the sheen of the lights reflecting off the mahogany shine of McCartney's hair. The Brazil date was part of McCartney's European and North American Out There tour. There are unlikely to be any such exotic creatures swarming onstage in Poland, Austria or Seattle. McCartney can afford to be cheerful about such minor interruptions. The current tour will add to the singer's current fortune which is estimated at £680 million, even after the divorce settlement from Heather Mills. He has been at the top of the Sunday Times music industry earners for 25 years and the royalties continue to keep him well ahead of upstart challengers like Adele, and he is still worth about three times as much as a contemporary, Elton John. Part of the secret is his showman's willingness to revisit his peerless back catalogue. The current tour features a host of crowd-pleasing Beatles classics and treasured album tracks including 'Paperback Writer', 'Being For The Benefit of Mr Kite', 'Day Tripper', 'Blackbird', Helter Skelter' and 'Eleanor Rigby'. On the other hand he will insist on performing the execrable 'Ob-La-Di-Ob-La-Da'. There's no excuse.